Enphase Energy was the first business to successfully market a micro-inverter and they are still the market leaders today. 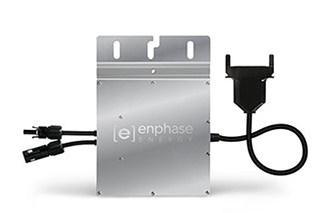 Enphase Energy delivers microinverter technology for the solar industry that increases energy production, simplifies design and installation, improves system uptime and reliability, reduces fire safety risk and provides a platform for intelligent energy management. Enphase have offices in the Americas, EMEA, and APAC. They have dispatched over 5 million units, ships to 11 countries around the world and employing over 400 staff. Enphase Energy in the News!